A table recently called me over to ask for guidance on the menu. It was their first visit to the restaurant and they wondered which dishes were most photogenic. “Are you here to eat or take pictures?” I asked jokingly. We shared a laugh about it but you could tell they didn’t want to answer honestly for fear of being ridiculed even more. The food arrived and, right on cue, they discharged their iPhones like paparazzi—cropping, filtering and geo-tagging the plates in front of them for several minutes before they finally got around to the business of digesting it. I’m not above taking pictures of my food. Food is beautiful. The care and craftsmanship that great chefs put into each plate deserves to be archived. I caught myself recently photographing a handsome dish from several luscious angles. To find the most flattering angle I spun the plate, repositioned the camera and even stood up to get a bird’s eye view. Then I tasted it. The dish was shockingly disappointing. But the photograph was gorgeous. A quandary. Should I abstain from posting the photo to social media because the flavor didn’t live up to the image? Should I attach a caption saying that it looks better than it tastes? None of the above, I thought. I should just eat the damn thing! 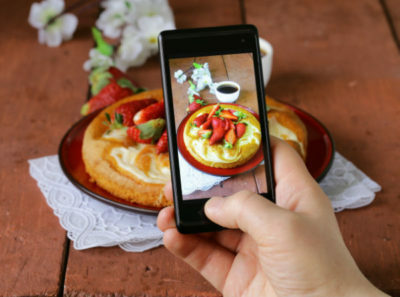 Smartphone cameras empower diners to capture more than just food they dine out. One night, while artfully reciting the desserts to a table, a woman stopped me mid-sentence, shoved her phone in my face and asked me to repeat my entire presentation for the camera. When I demurred, she treated me like I was being rude. Having a phone in your pocket that can capture video means your waiter owes you a private performance you can broadcast on Snapchat? Is that what constitutes attentive service in the Age of Social Media? Our need to document food experiences is disruptive to the flow of service and more intrusive to others than we think. A romantic dimly lit dining room transforms into a distracting strobe-lit club with the constant flickering of camera flashes. Waiters struggle to predict the timing of their tables when precious minutes are spent ogling the appetizers. Theaters prohibit photography to protect the audience, why shouldn’t restaurant patrons be given the same courtesy? 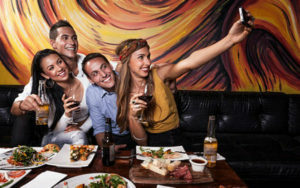 As with other kinds of live performance, the problem with mobile technology in restaurants is that digital documentation has become a way of validating the experience. It’s hard to imagine that dynamic disappearing anytime soon. Smartphones have become participants in the meal, there to weigh in on its success or failure. With a touch of a button, we can instantly arouse jealousy in all our friends that we scored a reservation at a trendy place. Of course, there’s something to be said for allowing other people to remotely share in our culinary experiences. 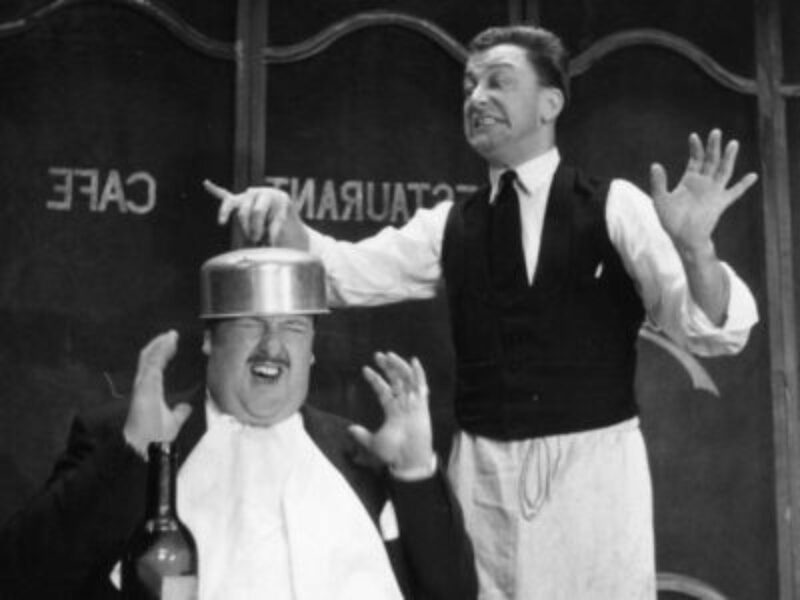 But as our attention deficit widens and our manners at the table erode, one wonders if in our efforts to embalm our restaurant visits if we have lost the ability to actively participate in them. It may be unrealistic to ban cellphones from dining rooms altogether. At the very least, though, we need to learn to feed ourselves first. Let the phones have seconds.